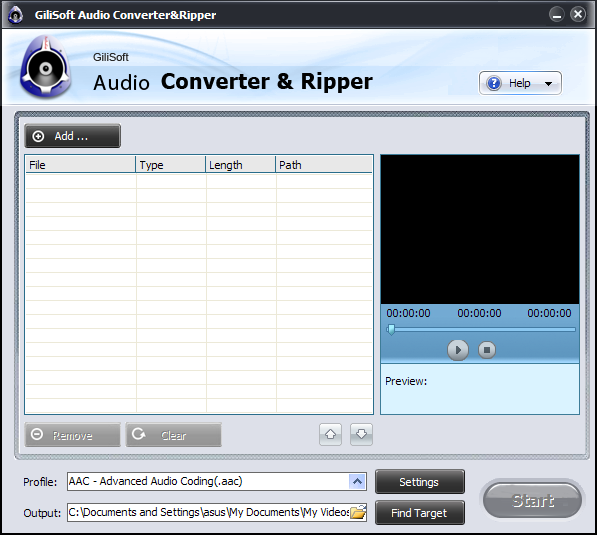 Gilisoft Audio Converter Ripper is an all-in-one audio converter and extractor, allowing you to both convert between different format audio files AND extract audio from video files to different formats. Gilisoft Audio Converter Ripper supports many video, high-definition (HD) video, and audio file types including AVI, MPEG, WMV, MP4, FLV, MKV, H.264/MPEG-4 AVC, AVCHD, MP3, WMA, WAV, AAC, FLAC, OGG, APE, among many others. ...... files from one form to another, audio formats supported include MP3, WMA, WAV, AAC, FLAC, OGG, APE, etc. It offers high-speed audio conversion with multithreading and multi-core CPU processing fully supported. Convert multiple files at once with support for batch conversion. Rip CD to MP3, WAV, WMA, OGG, APE and convert between these audio formats. Adjust a range of basic and advanced output parameters to fully customize your output audio file. Qweas is providing links to GiliSoft Audio Converter Ripper 4.0 as a courtesy, and makes no representations regarding GiliSoft Audio Converter Ripper or any other applications or any information related thereto. Any questions, complaints or claims regarding this application GiliSoft Audio Converter Ripper 4.0 must be directed to the appropriate software vendor. You may click the publisher link of GiliSoft Audio Converter Ripper on the top of this page to get more details about the vendor.